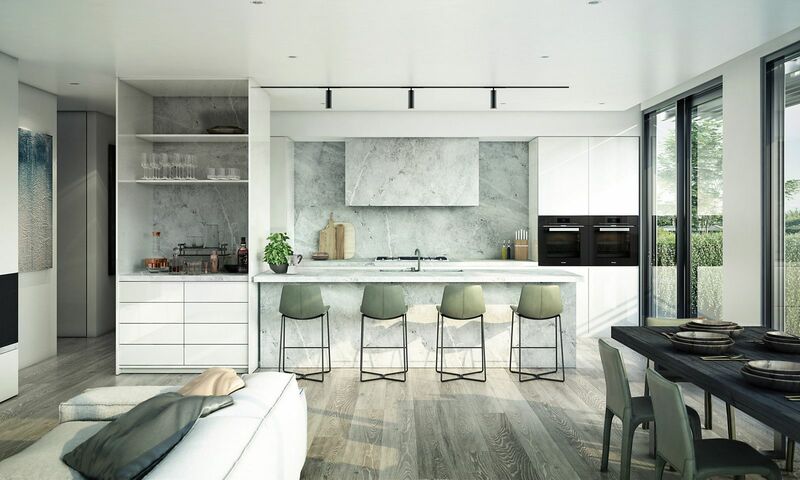 Some of the best design teams in Victoria have joined forces to help transform the State Bank of Victoria heritage building on High Street in Armadale into a new apartment project – Alara Residences. Bruce Henderson Architects and Carr Design have collaborated on this collection of just 20 apartments spreading across five floors. These exquisite homes sit within a stunning façade which features strong rectilinear forms, crisp white geometry and raw concrete materials, complemented by an abundance of glazing. Each home at Alara Residences has been thoughtfully designed to enjoy abundant natural light through the floor-to-ceiling windows found in every living space. Through these, residents can enjoy views towards Melbourne’s CBD in the north, and of Armadale’s leafy landscape in the south. The design teams have used an opulent range of fittings and fixtures. From the warm glow of the luxurious fireplace to handsome joinery and smoked oak timber floors the selection imbues each home with a sense of warmth. The penthouse includes bonus features such as open walk-in robes in the master bedroom, as well as a full suite of Miele appliances and full-height storage in the kitchen. Alara is located within walking distance of the amenities which make Armadale such an attractive place to live. Just across the road, there is an eclectic array of high-end boutiques and services within Kings Arcade. Along High Street, the retail and dining precinct thrives. Residents can pick up bread from Philippa’s Bakery or enjoy a glass of Melbourne’s finest wine at Toorak Cellars. And Zia Rina’s Cucina, an Italian restaurant with a contemporary twist, is minutes from the doorstep. Nearby, Cupcake Queen makes a delicious range of desserts, so choosing what to take to a dinner party will be easy. A tram stop just outside the door and a train station across the road ensure travel to and from the city, as well as to neighbouring suburbs, is easy. Enquire here to find out more about the stunning range of homes on offer at Alara Residences.